200 varieties of specialty cut flowers are available over the course of a 20-week-long flower subscription season from early June to late October, weather-permitting. Flower subscriptions are available for small, medium, or large bouquets ($15, $20, and $25 per bouquet, respectively) on a weekly, biweekly, or monthly basis (20, 10, and 5 bouquets, respectively). 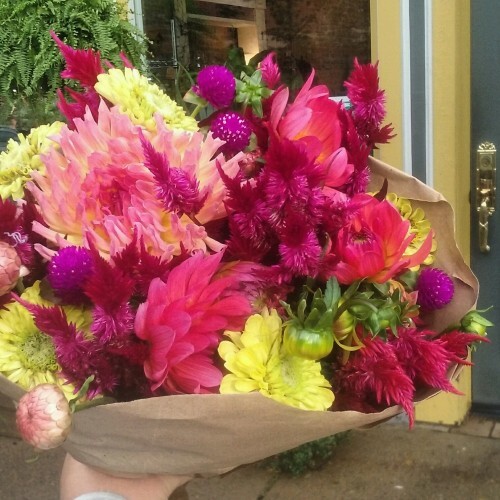 Flower bouquet subscriptions make great gifts for your loved ones who have everything! Bouquets will be delivered to a subscriber's choice of one of our established weekly pick-up sites in and around Pittsburgh. 2019 pick-up locations include: Beaver Falls, Burgettstown, Canonsburg, Crafton, Lawrenceville, Mt. Lebanon, Sewickley, Squirrel Hill, and Upper St. Clair. Email info@cherryvalleyorganics.com for more information.